I'm currently looking for a nitro chassis that I can use with a rare Kyosho Nikon Pajero body that I have. Come across this on Ebay but struggling to positively ID it. It is remarkably similar to the Kyosho RS200 cars and I am 90% positive it is Kyosho but there are enough differences to make me think it could be a copy (top deck, chassis plate, fuel tank, rear body mounts etc). I have all the Kyosho catalogs from 1989 as well and cant link it to any model listed or am I just getting old? I'm not nitro expert, but I can see your thoughts about the 'Kyoshoness' of the chassis parts - the wishbones, the rod ends, the shocks and towers, the round holes in the chassis. I'm not sure it is a Kyosho though, fuel tank is on the wrong side compared to most of Kyoshos offerings. Plus fixed plastic camber links ? Agree, I'm sure shocks are Kyosho and a few other bits do lead me that way but RS200 series has a different drive system out of the rear gearbox, fuel tank isn't Kyosho and looks to be on the wrong side. 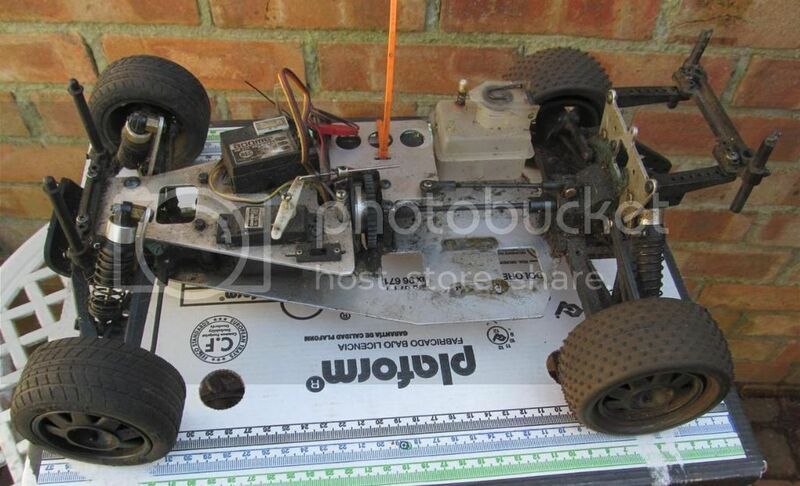 I found a seller on Ebay who sold both top deck and chassis plate on Ebay but listed them as RS200 parts. I own both the RS200 and 405 and know they are not. Looks like a T2M Peugeot 206CC Nitro to me. Though not 100% sure but according to the rims, this could be your model. I believe, T2M did use some Kyosho parts on their cars, as T2M are the Kyosho importers for France.